Does data growth leave you struggling with complex, distributed, and costly data protection? Do you have data that’s not being protected because backup windows aren't long enough or backup jobs are failing? Tackle the cost, risk and complexity of data protection with HPE StoreOnce; disk-based, deduplicating, backup systems providing automated backup, data recovery and data retention for the new style of IT. Cut the cost of data protection with a single, unified deduplication architecture offering best in class price-performance across the range. HPE StoreOnce spans from small, remote offices to enterprise data centers with highly scalable dedicated appliances to agile virtual appliances and with your choice of backup and recovery software to deliver robust, flexible enterprise-wide data protection. StoreOnce can reduce the amount of backup data you need to store by up to 95%, and with our scale-out architecture you can pay-as-you-grow to retain up to 34 petabytes of data in a single pool. Reduce the risk with industry-leading backup speeds of up to 184 TB/hr* so you can meet shrinking backup windows and the most stringent SLAs. When it comes to backup, data recovery and data retention, HPE StoreOnce includes all the features you'd expect from disk backup, together with built-in data encryption to secure your Data at Rest and Data in Flight**. Simplify and enable your converged infrastructure, with HPE’s single StoreOnce deduplication technology managing the movement of data across the enterprise has never been easier. HPE StoreOnce Catalyst enables Federated Deduplication so you can choose where to deduplicate your data and eliminating the need for dedicated deduplication appliances. It also allows Catalyst stores to span nodes simplifying backup management and optimizing available storage in large environments. StoreOnce also provides seamless integration and flexible connectivity into Fibre Channel (FC), iSCSI SAN, GbE/10GbE, virtualized and other environments and is supported across a wide range of backup applications. From ROBO to the entire enterprise, HPE StoreOnce System with HPE StoreOnce Catalyst is a single, efficient and secure data backup and recovery solution. Reduce costs and keep pace with rapid data growth, confident that your SLAs are securely met and your valuable data is not at risk. 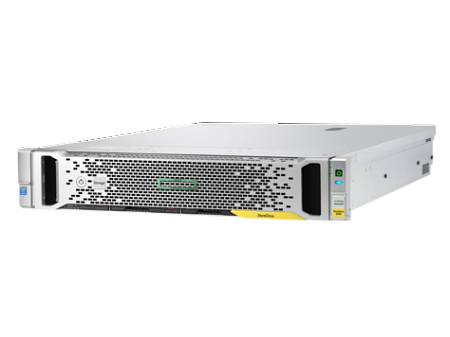 HPE StoreOnce portfolio ranges from entry-level StoreOnce 3100 backup appliance, to the scalable StoreOnce 5100 for enterprise-class capacity and performance. You can even monitor your StoreOnce backups through a handy mobile app.